Here are some screenshots from a recent version of the app, showing the interface in some detail. Click on a thumbnail to get the full image (quite large). Drag and drop turn entry and map manipulation. Selectable information halos around worlds or as a sidebar. Map editing is a breeze, select and drag. 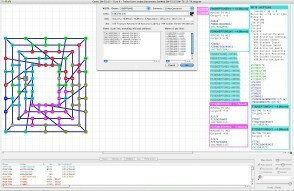 Advanced mapping tools, such as synthetic annealing and loop finding. Map manipulations, such as rotate, mirror, and shift links. Information displays sortable on any field. Point-n-click order entry and validation. Simulates the results of orders. Shows you things like how much metal a world will have next turn, how much is incoming, how many shots a fleet is going to take, and more. Even tries to estimate population and convert increases, and deduce the scores of other players! Runs on Mac (Intel only), Windows and probably Linux too. Undo and redo are fully supported to infinite levels. Import and export of turnsheets, maps and order lists, customized for each player, using information that other players have decided to share with them. Alliance coordination tools, such as commented order lists. The Macintosh version of WebLord runs on Mac OS X 10.6 (Intel Macs only) or better. The Windows version runs on Windows 2000, XP, Vista and Windows 7 (and probably later). My RealBasic license also lets me build a Linux version. Totally untested, no idea if it works! You may also need recent versions of the following packages: glib-2, pango, atk, openssl, zlib, and expat. ©2006-2012 Robert Woodhead. WebLord&trade; is a trademark of Robert Woodhead. WebLord is currently freeware. This may change in the future, but probably not. Comments & bug reports to trebor@animeigo.com. * Fixed problem with robot attack orders after ship transfers. * Another artifact matching bug. * Bug in the code handling SIGNs could crash the app. readable format during "Save As" or Closing-window-save operations. that are "at peace" can and will ambush. * Better tracking of fleets that were seen on previous turns. * Better handling of orphan Weblord processes under Windows, avoids a minor issue. now contains the title of the window being closed. * Fixed a rare crashing bug in the Check Overlapping Links feature. * Fixed some compatibility problems with Windows 7. * Added Other:Resize to fit on Main Screen menu option. * Added preference item to enable and disable popup UI helptags. * You can now plunder worlds, even if you are not a pirate. * Minor tweak to Diplomatic message window error handling on Windows. * You can now export graphic maps on Windows. * Manually adding links now works, though it is not recommended. * Could not probe with pships under certain circumstances; fixed. next time the file was loaded. player has deliberately un-allied with one of his own positions. * Found out that unload, jettison and CG unload are not mutually-exclusive. some bizarre coordinates that windows uses to fake minimization. Also, the app will attempt to restore a minimized window before saving. so subsequent saves stored in the original file, not the new one. * Save As... now defaults to using a new file name "&lt;old file name&gt; copy.swgame". Previously it would use "&lt;flying buffalo's game name and turn&gt; copy.swgame"
and wrapped; at least, a little better. as well as Ally/Loader/Met messages. * Fixes to bugs in import and entry of artifact transfer commands. handled in a much more elegant way. * Fixed sorting of player lists by score, and other numeric fields. fleets at the start of the turn. is to a node. This is on my fix list for the next version. one of the links was to a node. * Now can import the *IDLE pseudo-order. * Link style dialog now lets you select one of 6 colors for a link. * Fixed minor glitch in next-turn convert growth calculation. * Now can import "Revised" turnsheets that FBI sends out when there's a mistake. they break up artifact names (by far the most common issue). you should export the orders for each player individually. * Better keyboard handling on map. Map= info. Also output on Map Exports. are a serious pain to test. like Metal and Mines, Pop, Limit and Turns, and Iships/Pships. worlds have red halos, and worlds that are both have magenta halos. a time to inspect them -- really reduces the clutter. * Fixed obscure import turnsheet / undo / redo crashing bug. and finding just the right world to visit to grab metal from. of problems. Also counts the ambush pseudo-order as an action. * Found and fixed crashing bug in auto-commenting of fleet probe orders. it, but it's now done internally. * Nodes that point to black holes display as black holes. when the order traversed a node as opposed to a direct map link. makes me long for the days of simple ASCII code! * Ambush pseudo-orders now appear in commented order lists. their orders into a single order list (which is what you want for a multigame). if needed so that at least one world is visible. * Order import made more robust, less chance of a crash from malformed orders. * New autocomment feature puts detailed comments on all orders automatically. change. Delete a comment completely to restore it to the automatic state. manual comments by a "#"
player, resulting in the first order being omitted. * Search now understand Art=PLAYER query. * Check Orders now checks for unused builds. * Check -&gt; Order Problems... now flags fleets that will enter black holes. target has to match for things to be exclusive. halos. So if checked, entries like Ind=0 won't appear. another world, the first world is unselected and the new world is selected. This lets you quickly look at individual worlds simply by mousing over them. in a pleasing way, so you don't have to clean up their positions as much. * Found and fixed crashing bug when you tried to undo a node creation or removal. you'll need to move to build your map. Lather, rinse and repeat. map on current world, H to hide selected worlds, and S to show hidden worlds. * Path finder can now traverse nodes, as can the various "select worlds within n jumps"
handy for selecting the destination world for a movement order! specify an explicit path to or through it. * Fixed bug in ambush checking. have been entered are listed, and controlled players are checked off for you. * Order import now maintains order comments when you import an uncommented order list. if a new comment is not specified for that order. * Art on fleets stopped getting recognized; fixed. wraps occur, it is sometimes hard to see new wrapping links that get added. * Order parsing would not accept orders for F255 or W255 and claim they didn't exist. * Shared maps handle appropriate display of nodes in a more elegant way. it much easier to comment the orders. * New "Copy orders to clipboard in listed order" option in the Orders contextual menu. complete with comments and a label that shows what player is executing what order. each world, if sorted in "At" order. * Order import now understand the format of "Copy orders to clipboard in listed order"
order lists, and can read them. It can also read signs and messages. next order's comment, or shift-tab to go up to the previous order's comment. them to screw up on very tightly connected maps. * Fixed rare crashing situation in the score deduction code. * Partial printouts were sometimes not giving complete link lists for unseen worlds. are used to unroll the maps. * Better import of order lists with strange spacing and alternate space characters. &lt;PLAYERNAME:ORDERS&gt; comments aren't needed as much. assets, and asks if the order should be accepted. gaming out what they might do). * &lt;NEUTRAL:ORDERS&gt; now listed in consolidated turnsheets. but who has no known worlds or fleets. circumstances (creating the bug mentioned above). * Gifts and Jihads can now only target players that have been met. that the sharing is bidirectional. * App was not properly moving the map/info splitter when a document was loaded. ambushers (which may cause them to be unable to ambush). to make them easier to distinguish from worlds when the map is zoomed out. * Consolidated turnsheets were not showing art on worlds! * Consolidated turnsheets were not showing who the owner of converts were. * And they weren't showing art on fleets either! * Turn import wasn't handling PBB Built messages quite right. * More informative displays when PBBs are built or dropped, and fleets are lost. * Unloading consumer goods on a world without converts was creating "negaverts"! * Slightly improved parsing of turn due dates. * The app was giving Apostles a chance to convert robots. Impressive if they could! * Plundered worlds no longer show available mines or estimated population increase. * Moved the various copy-to-clipboard contextual menu items into a submenu. avoid problems, you first delete all the old orders, then import the new ones. with your info and BETTY's. ADAM and CALVIN, and CALVIN can share with BETTY, for example. of all the other players that have decided to share WITH that player. * Graphic maps now have a title and color-coded legend. appear in the right places on the map. "helpful" word processors and spreadsheets). saw this happen in SW-1358, Turn 4.
map, and then actually described on another player's turnsheet. type commands. They are now handled properly, I hope. which in some cases could cause a crash. complete info on (such as a merchant who hasn't sent you turn info yet). for more than what was available. let you see what's available next turn, the turn after, or 3 turns from now. cause either an inconsistent display or even a crash. * Could not probe with newly built I- or P-Ships. that is, it has not orders for which it is the initiator vs. the recipient of the order. So a fleet that is built onto but then does nothing will trigger the message. * Possible non-loader warnings now appear in the log only when you do a Check Orders. You will still see a flag in the fleet information halo. * Check -&gt; Order Problems now checks for possible ambushes during fleet movements. It assumes all non-allied fleets and worlds will ambush. change a robot attack that left the fleet with a single ship. ships that exist at the start of the turn. for probe and scrap orders. changes, the app would bomb. on the turnsheet slightly differently that I expected. if you have enough ships. * The XML in .swgame data files is now prettyprinted to make it easier to read. previously it would let you try and attack with all the ships. robots will be generated, and what the results will be. within 3 jumps that have fleets on them. Handy for finding reinforcements! running around creating a museum. key, you won't be able to enter a move order in the first place. * Adding and then removing a firing order did not remove the TARGETING message. are apparently hard to count. * Added new "converts=&lt;player&gt;" search option. owner. Shortcut: just type in the owner name. in Artifacts, Artifact or Art to do "Artifacts&gt;0". though no doubt, he wants them (grin!). due date in the title bar of the document. between them. Also indents fleet info blocks slightly to aid in picking things out. unselect worlds to unclutter the sidebar display. * BLACK HOLE info halo simplified. * Added special screen digit fonts that make world numbers more legible on tiny maps. complete info when multiple turnsheets were entered. could not unpeace them. I'm just a pacifist at heart, I guess. * Print now honors page start/end selections. info about the current state of the worlds. the &lt; or &lt;= operators were used. * Wrapping of long world/fleet info lists when in sidebar mode slightly improved. * Probe orders were not being handled correctly. to the older system, which you'll only need to do if you're doing "out and back"
moves that visit a world more than once. feature from complaining that the fleet isn't doing anything. last order in the line. treatment of numeric loads vs. "load all" commands. they expect with an UNDERLOADED comment. attempts (but assumes that the load will go through). you'll see the NON-LOADER? flag in the fleet. on load (and possibly crashed the app!) it is likely to be a weird wrap. not end in a ]. This is sort of a bandaid, but it works for standard turnsheets. The problem happens when you forward a turnsheet and it gets quoted and wrapped. * Consolidated turnsheet now flags out-of-date information. * Turnsheet to Clipboard also available as a map contextual menu action. or a fleet) to different destinations. redo the score computations, and update the value of the Last field for the player. about a world, its fleets, and movements through it. Useful for hand-editing the map. is from) in the header line. into the application. It gets grumpy but doesn't go titsup. it now opens the file in a new window. * New searchbox in the window lets you hilight all worlds/fleets that match the query. "Vegan" to find all the Vegan artifacts, "Captured" to find all captured worlds, etc. Flying Buffalo. But they did make it onto the consolidated turnsheet. Whups! perfect, but makes for a better display. if a halo is collapsed, you don't see the order list, but do see the effects. so you don't have to decipher the orders to figure that out. * Max map zoom increased, and max world number block size decreased. * Some Windows XP users were having a problem where a new game could not be saved. included an empty "New Game.swgame" file in the distribution. If you still run into this problem, I would greatly appreciate knowing about it! * Can now drag/import/paste orders as well as turnsheets! makes it easier to find it on the map. * Plunders and CG drops now update the world info panels with notes as to the action. a map position conflict when there actually wasn't one. Harmless, but annoying. 0.9a, so almost certainly won't affect previous versions. * You can now paste turnsheets/moves into the app as well as import and drag. * Import options (and Paste) were not saving an undo position; they do now. to see what's arriving next turn. * Fixed glitch in Ally/Loader command updating. * iShip and pShip status was not updating properly when a new turnsheet was added. menu popup of the player list, you can check and uncheck allies. delete all the orders by the item, or all of the orders by/affecting the item. the most with the background. map location information as an extra information field. fleets that don't seem to be doing anything. * You are now warned if you try and move a fleet that has no ships. * If no worlds are selected on the map, the worlds list shows all the worlds. * Accidentally removed logging of loops to log panel; added it back. * PBB builds and drops were restricted to Berserkers; this has been fixed. * App would crash when you try to enter orders for a world with an IShip or PShip. * Was not permitting a world to build onto two different fleets at the same time. (on incoming fleets) in parentheses. 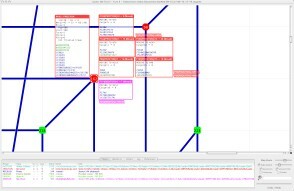 * Added "Double World Spacing" and "Halve World Spacing" map manipulation options. just when recipient is an artifact collector. * Signs, Messages and Anonymous Messages are now supported. * World Information halos now have world number in the header, not just owner. * Initial stab at order entry. Handles all the starweb orders I know about. * Players in the player list can be marked as "controlled" or "uncontrolled". You can, however, enter commands for any player, even neutrals. population growth). In some cases (conversion, for example), these are estimated. * Last seen counter wasn't getting updated properly. file must be saved on quit. * Ability to change font size of the lists.